The sun is peeking out this morning~and dancing across the floors! through my windows this morning! 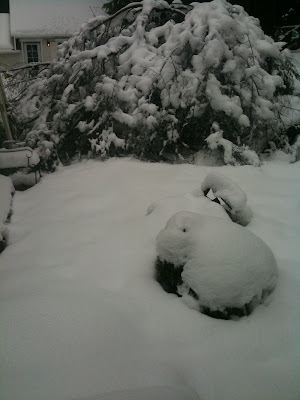 My backyard looks like this yet... this was taken this weekend. (Can you believe I am in California? wet snow that accumulated overnight one night. So we will be rebuilding & re-imagining our outdoor living space soon. Once the snow is gone, I will be able to map out a bit of what I am thinking. and grabbed them to thumb through again. Inside one of them (Traditional Home) there was a whole section on outdoor rooms. 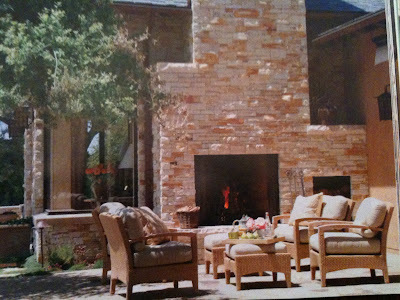 I love outdoor fireplaces and would love to have one in our backyard area. I would love to move it to the backyard! Wonder if it could be done easily? Gorgeous pergola with pillars much like ours had. I don't know yet if we will rebuild using the columns or use them somewhere else. 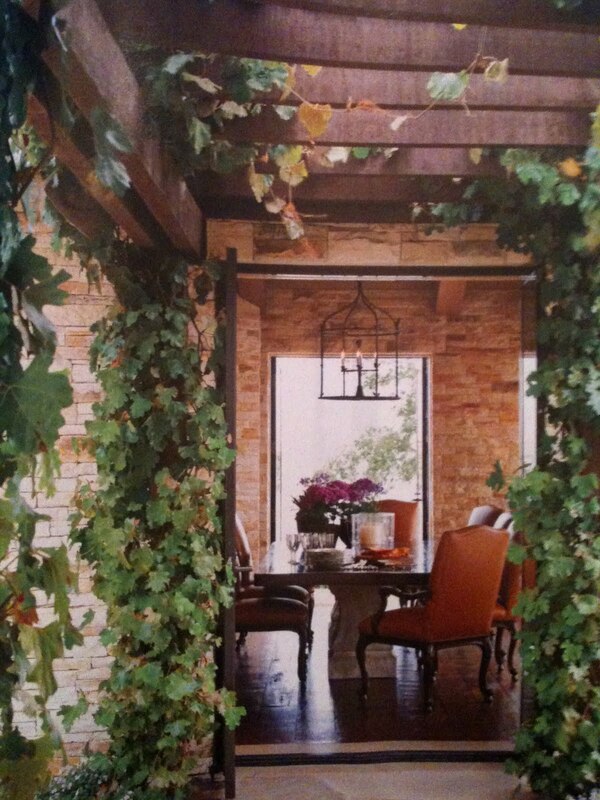 with vines and sweetness- so storybook and charming. How about a darling little bench to sit on made out of branches? Okay, back to the book search and some projects. What great inspirations! We started planning our back yard this weekend! Ahhh, to dream! Sorry about your pergola! and sorry about all the snow. We have snow and rain too (northern Utah) until early June, so no spring here, we go straight from Winter to Summer. The third picture of the fireplace is gorgeous, hopefully you can move yours to the back yard. Happy Monday back to you! Some wonderful inspirations here. 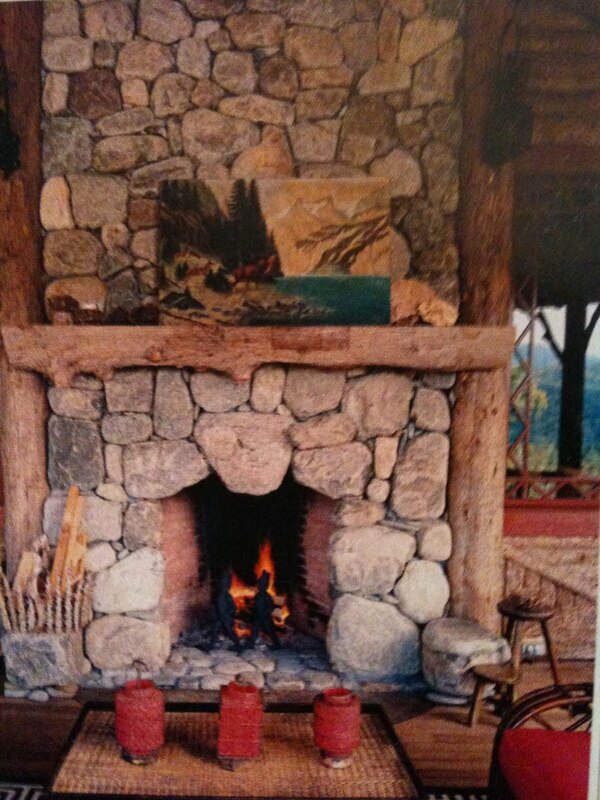 I love the stone fireplace too. And I just still can't believe the snow thing! Oh goodness... that outdoor fireplace would be dreamland! And no, I cannot believe you have snow!! Keep to the magazines for comfort! How surreal that you have more snow than we do in Chicago! We still have all the blowgard politicians, though! LOL! You must be in Northern California. I can't believe that! Hope it melts right away. Gorgeous outdoor inspirations! 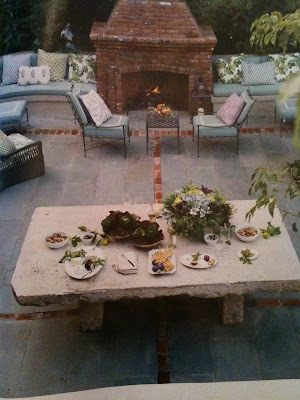 I love the idea of an outdoor fireplace. Mmmmm it sounds so cozy and a great way to kick back with family and friends. 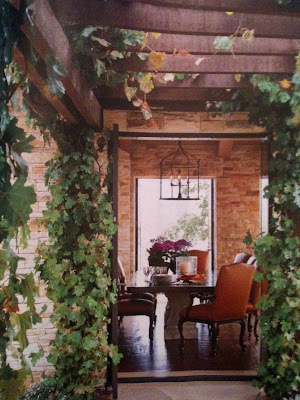 I would LOVE to have an outdoor space like some of these. The fireplace is a must! How cozy! Sorry about all of your snow. We are expecting some this week. Will it ever end?! Oh my goodness Courtney. I'm sorry to hear about your pergola...that's crazy! 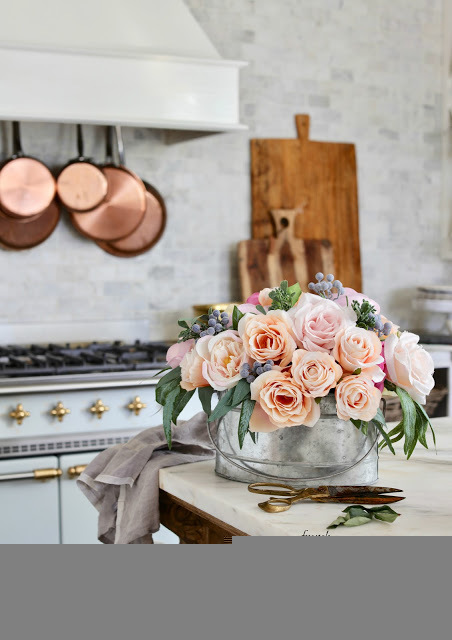 However, just look at it as a chance to start a fun project and you sure have lots of lovely inspiration for outdoor living. I'm sure you can't wait till it finally warms up there. I love a rainy day to have the time to dream of the sunny days that I have to recreate beauty in my yard....love your dreamin ideas, they are fabulous!! I too am in Ca, central, so no snow here, but it has been cold and rainy for days and days. Heard it will be in the 80's by next week!! 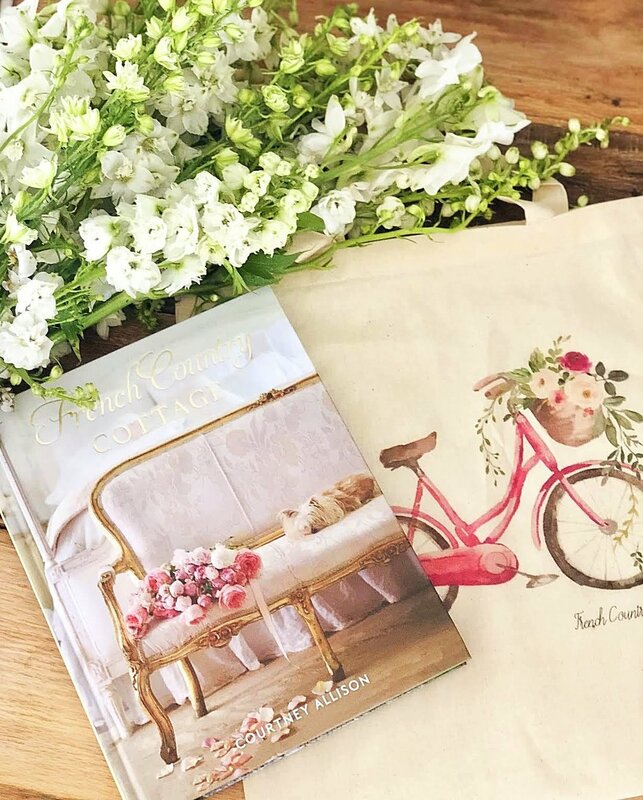 Love your blog, keep up the dreamin..
Beautiful pictures Courtney. We don't have an outdoor fireplace with a stone chimney, but we do have a pot belly stove in our pergola, and it's beautiful out there on a cold night. Really hope you get some sunshine soon. Thank you so much for stopping by! I can't believe this is all in beautiful sunny California, this looks more like Oregon snow...wet and heavy! 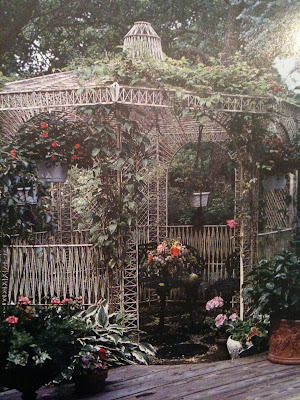 The Pergola was lovely and will be again and maybe even better than than the "before" pictures...I have no doubt! So glad to meet you, I am now following!! 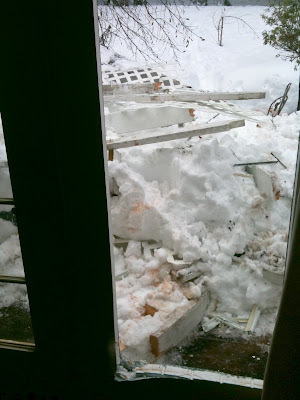 I missed the post about your pergola collapsing! We've had more snow than usual here too. I hope it melts away soon for you. Your inspiration photos are beautiful. Can't wait to see what your new space! Courtney! I cannot believe that you still have all that snow! UGH! And, it must make your heart ache a bit to look out and see your pergola that was once so stately and beautiful laying in a heap! We still have a lot of snow here too...but this IS Wisconsin and not CA! Good heavens, I can't believe all the snow you have Courtney. I'm almost thinking it looks like more than I have and I'm in Minnesota! I think we must have swapped weather forecasts. It's really sunny here - unseasonably sunny. Not that I'm complaining!! 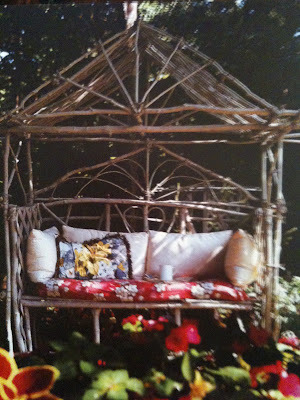 I LOVE drooling over outdoor pictures and planning my perfect garden space. Swoon!! 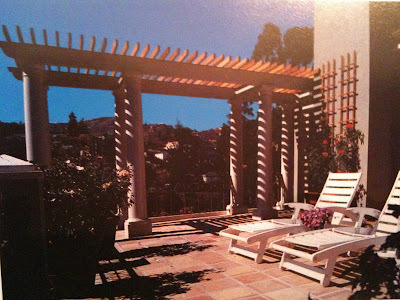 I hope you find the perfect replacement for your poor, fallen-down pergola. Oh, I hear you about the weather. So tired of snow.I've been thinking about outdoor fireplaces lately. I told my husband he needs to build a stone fireplace near the creek(he hasn't said no, yet). 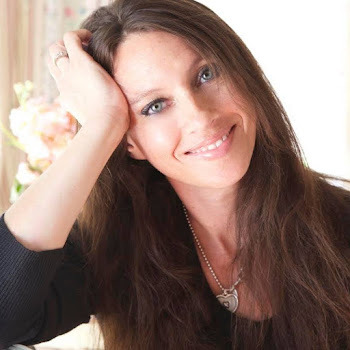 Your photos were very inspiring- I think I'll have the hubby take a peek later.Have a beautiful day! I can't believe you live in sunny California either! This winter will certainly go down in the history books as one of the worse. Your pergola mishap is sad but I must confess ... I am excited to see what you come up with as a replacement! Gorgeous images. 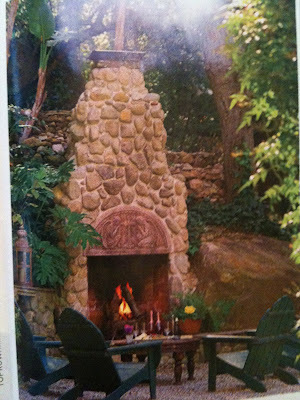 I would love to have an outdoor fireplace. Oh that stinks... but after the mess is all cleaned up you can set yourself up for a space all your own! Love the idea of adding a fireplace. what has happened to spring thats what I want to know!! Good morning! Hope the sun is melting that snow away; its doing it up here... love those pictures! Its the perfect post to get me thinking about what to do when all the white stuff disappears! 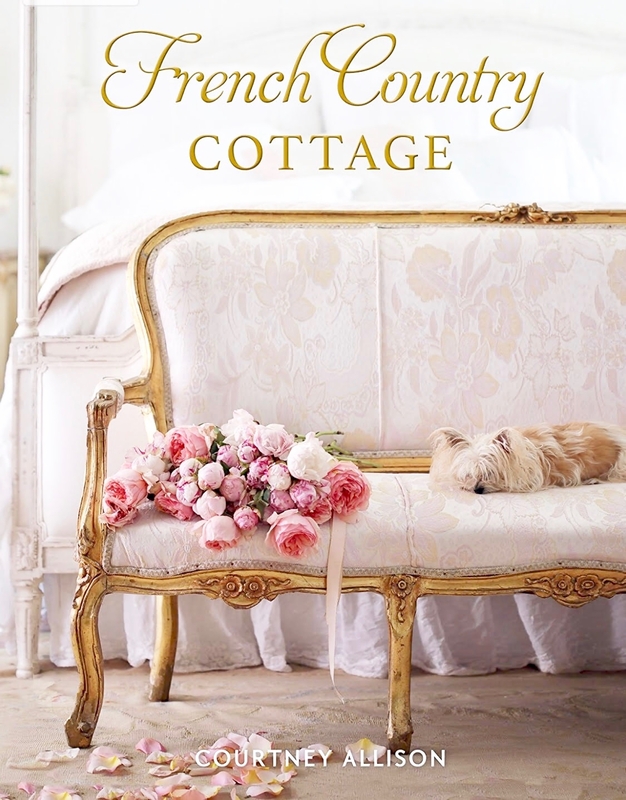 Courtney, I am crying with you over your pergola, but I know you will make something even more beautiful and I hope that crazy weather changes for you soon! Hugs to you sweetums! I am feeling the same way, can't wait to sit outside in the garden in warm weather. We are having some beautiful weather today in Los Angeles, so hopefully it will be soon! Love all you inspirations! Courtney, I am inspired! Lovely pictures. 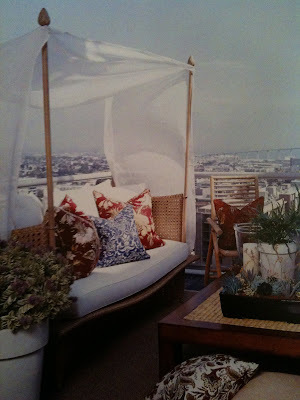 I would love an outdoor space like one of these! Oh my my my my! I can't believe you have snow this late Courtney! It was 87 last week and today it was only 58 at 1 p.m. but by 4 it was 68 so not too bad. Crazy weather. Sorry abt your outdoor space! :( I know what ever you decide to do will look wonderful!